I love making shish kabobs. They are quick and pretty much fool proof –great for dinner parties! With the warm weather finally here, now is the time to explore all the creative and delicious recipes you can concoct with just skewers. I was wanting something a little different than the traditional kabob (pepper, onion, meat, pepper, onion meat…) so I decided to add some pineapple. I didn’t stop there. I made a tangy, sweet marinade for the meat and finished off my grilled kabobs with a pepper jelly and pineapple glaze. Unfortunately I don’t have an outdoor grill since I live in a tiny apartment with no balcony. My George Foreman worked just fine, but I’m sure these would taste even better if cooked over an open flame. I served my kabobs with a simple salad made with spring mix, avocado, mango and a lemon/ olive oil vinaigrette. 1/3 C red pepper jelly ($.75) – I used Reese Hot Pepper Jelly. You can find this at most supermarkets in the jam/ jelly area. Mix the marinade ingredients in a large bowl with a whisk. Add the chicken to the marinade (or you can put it in gallon size plastic bag). Let the chicken marinate in your fridge at least 4 hours, the longer the better. 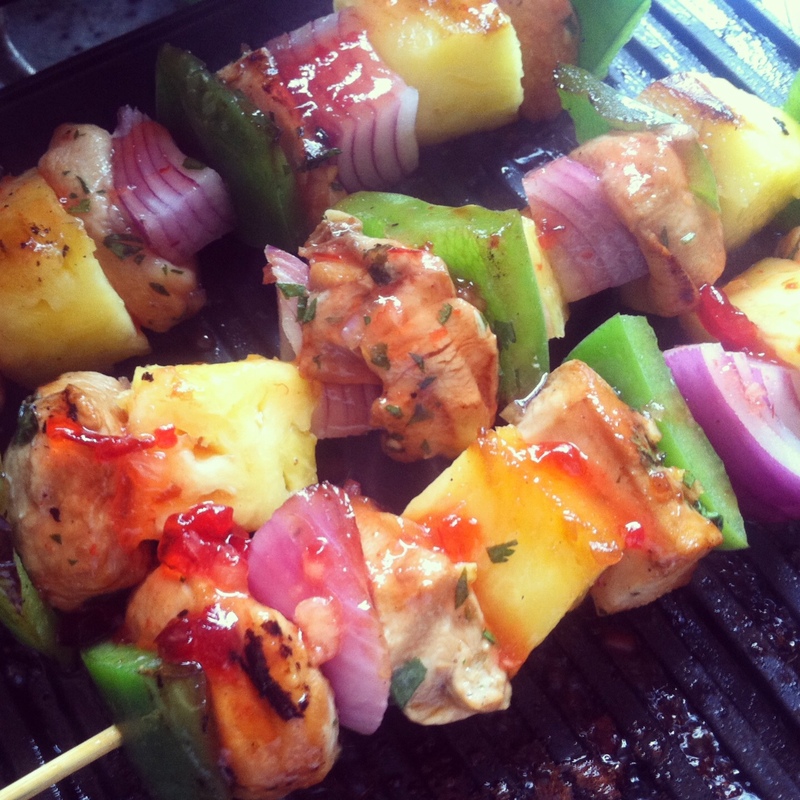 Skewer the pepper, onions, marinated chicken and pineapple on bamboo skewers. Cook kabobs on medium heat grill until chicken is cooked through. 1 minute before the chicken is done, heat the pepper jelly and pineapple juice until the pepper jelly is melted. Brush the kabobs (while still on the grill) with the glaze. Remove kabobs from heat and let rest for 3 minutes. Serve immediately. After waiting at the grocery store for 10 minutes on “where can I find pepper jelly”, I was sadly told they no longer carry it. That was the beginning. Determined to make this recipe, I hunted down some chili sauce which I combined with grape jelly and some hot sauce for the glaze. While making the marinade, I realized the second bottle of soy sauce I had wasn’t soy sauce, it was worcestershire sauce; so my marinade was 50% SS, 50% WS. ANNNDDD I didn’t buy pineapple juice, I bought pineapple pulp, so my marinade was a little chunky. Nonetheless, I put the chicken in the marinade for like 18 hours and did the cooking thing this evening.